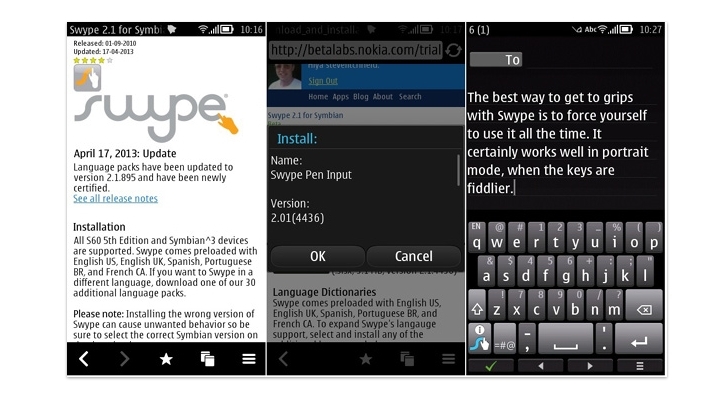 A new flavor of Swype for Symbian is now available for download for the owners of Symbian-based devices, with only a small set of enhancements packed inside, and still featuring the beta tag next to it. According to the release notes for the app, available courtesy of Nokia Beta Labs, the language packs for the application have been updated to version 2.1.895 and have been newly certified. The application is available for download for all S60 5th Edition and Symbian^3 devices, and comes preloaded with English US, English UK, Spanish, Portuguese BR, and French CA right from the start. Furthermore, the virtual keyboard provides users with the possibility to download and install 30 additional language packs on their devices. Users will find the Swype for Symbian application available for download on this page. They should make sure that the right flavor of the app is downloaded.